From stone, to canvas, to words on a page, for centuries New Mexico has served as an inspiration to artists. 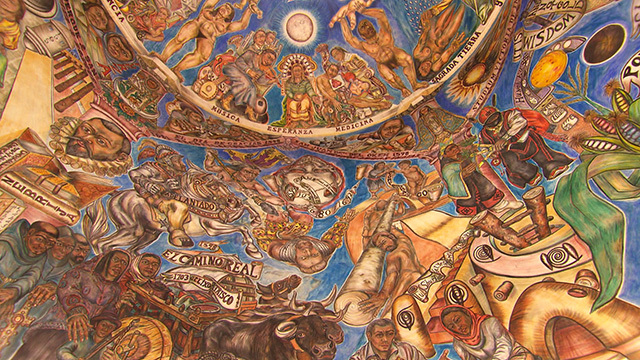 Our original documentary New Mexico Masterpieces features some of the Land of Enchantment’s most enduring, pivotal, provocative, and beautiful artworks. This special one-hour documentary tells the stories behind Chaco Canyon’s Pueblo Bonito, Georgia O’Keeffe’s Grey Cross with Blue, John Nichols’ The Milagro Beanfield War and more. PAINTER GEORGIA O’KEEFFE’S FIRST VISIT TO NEW MEXICO IN 1929 FOREVER CHANGED HER LIFE. 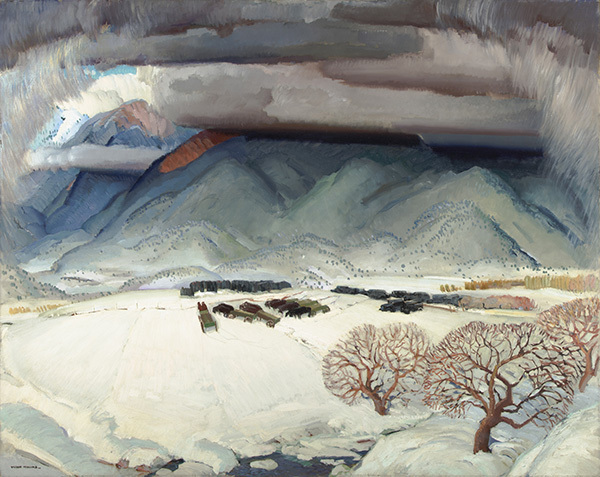 TAOS LANDSCAPE PAINTER VICTOR HIGGINS’ SOMBER AND BEAUTIFUL PAINTING WINTER FUNERAL CAPTURES A MOMENT IN THE HISTORY OF TAOS VALLEY. TAOS PAINTER ERNEST BLUMENSCHEIN’S BEAUTIFUL AND COMPLEX, STAR ROAD AND WHITE SUN PROVOKES A NEW DIALOUGE. 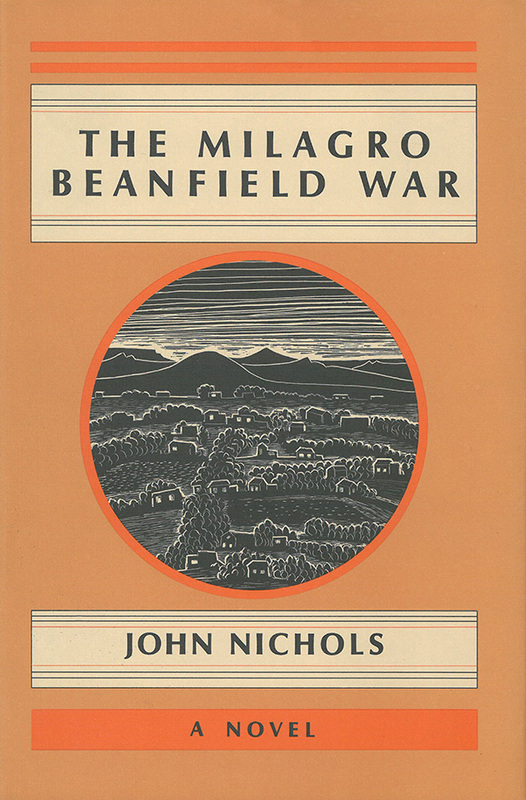 TIMELESS, LOVING… THE MILAGRO BEANFIELD WAR CAPTURED HEARTS AROUND THE WORLD THROUGH MIXING CULTURE, SOCIAL JUSTICE, AND HUMOR. AUTHOR JOHN NICHOLS SHARES HIS INSPIRATION FOR THE STORY. NATIVE AMERICAN ARTIST T.C. CANNON KICK STARTED A MOVEMENT. HIS VIBRANT WORK COLLECTOR #5 CAPTURES THE HEART OF A REVOLUTIONARY TIME AND AN ARTIST WHO COMBINED TRADITIONAL CULTURE AND LIVING IN THE MODERN WORLD. RENOWNED FILMMAKER, GODFREY REGGIO, CREATED THE INTERNATIONALLY ACCLAIMED FILM KOYAANIQATSI. 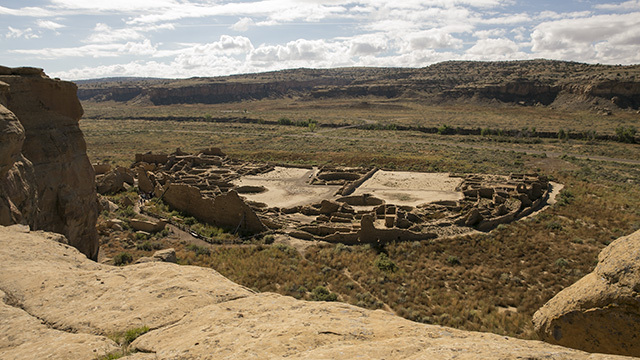 HIDDEN BY TIME AND ITS REMOTE LOCATION DEEP IN CHACO CANYON SITS PUEBLO BONITO, ONE OF NEW MEXICO’S GREATEST WORKS OF ARCHITECTURE.